Sound Effect, Pack 12B Footsteps Part 2. 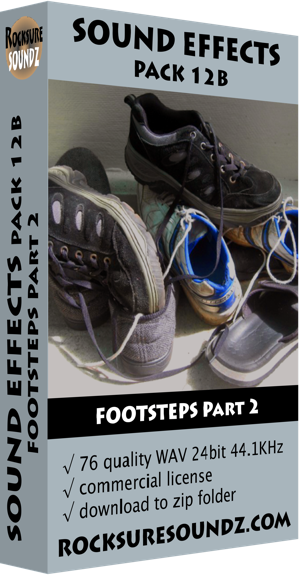 A follow up pack to the first one in the footsteps series, this contains a range of shoes, scuffs, and bare feet, and it covers both male and female walking sfx. It even additionally includes some walking in water sounds. All sfx were recorded with high quality microphones and analog recording equipment, and are presented here as a zip of 24 bit/44.1kHz wav files.